Having inherited a unique blend of African tribal ethnicity with Sufi mysticism, the Sidi Goma drummers and dancers are joined on stage by path-breaking maestros of percussion in India, each featuring various classical drum traditions. Together this large percussion and dance ensemble will present an entirely new and mesmerizing sound, supported by modern musical arrangements and electronica. Ranjit has conceptualized this performance as a meeting of the Ancient with the Now. Drums were the first form of communication we had. It is a primal language, as old as the heartbeat. 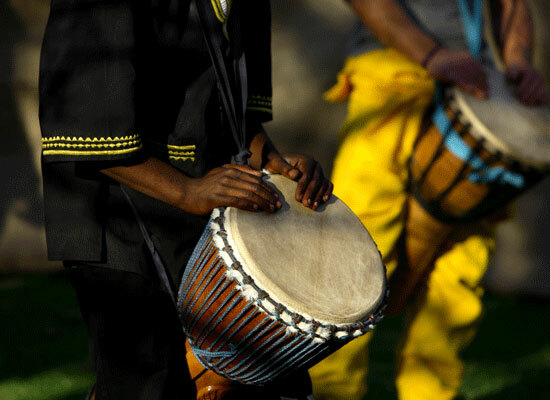 Every ritual, every festival and major social gathering featured drums and rhythmic expression. Coupled with dance, this was a joyous union of two intertwined disciplines, one feeding off the other, fuelling each other, rising to a fever pitch and then dynamically dropping to a murmur—but never losing intensity. Drumming it self is a dance of sorts. Mimicking its sibling, it provides a syncopated bed of rhythm to which the joy of movement can be choreographed. The production has been designed to celebrate this spirit that essentially moves through every living being. The Sidi Goma community is at the very heart of this musical and rhythmic construct. A little known tribe from Western Gujarat who trace their genealogy and unique cultural traditions directly to Africa, they arrived on our shores eight centuries ago. They are a rare gem in the myriad array of folk art forms in our great country and bring together a unique blend of ancient African ethnicity with Sufi mysticism and musical influences. Theirs is a celebration of Earth and Spirit, through dance and drums. This segues into a large, mesmerizing percussion ensemble in which Ranjit has gathered some of the best and the brightest of India’s drummers and percussionists. isThe modern musical arrangements and electronica, will be a foil to the tribal tradition of the Sidis and the intricate rhythmic patterns of the ethnic drum masters. Featuring konnakol and Vedic chants to draw in the hearts as well as minds of the audience, this performance will pay high tribute to the humble drum.